What do the Spanish think about foreign people? But sometimes (well, maybe often would be a better word) Spanish people read what I’ve written here on this blog and get pissed off. They say I’m generalizing about Spanish people and their culture, and that I obviously have no idea what I’m talking about. Of course, it’s true. I am generalizing. Not everybody over here is dishonest, or badly dressed, or a prostitute, and it wasn’t my intention to paint them that way. However, it’s impossible to write about a nation of 46 million people without doing a lot of generalizing, so that’s exactly what I do. It’s my blog, and of course, it’s my opinion! If your opinions are better than mine, you’re welcome to start your own blog. 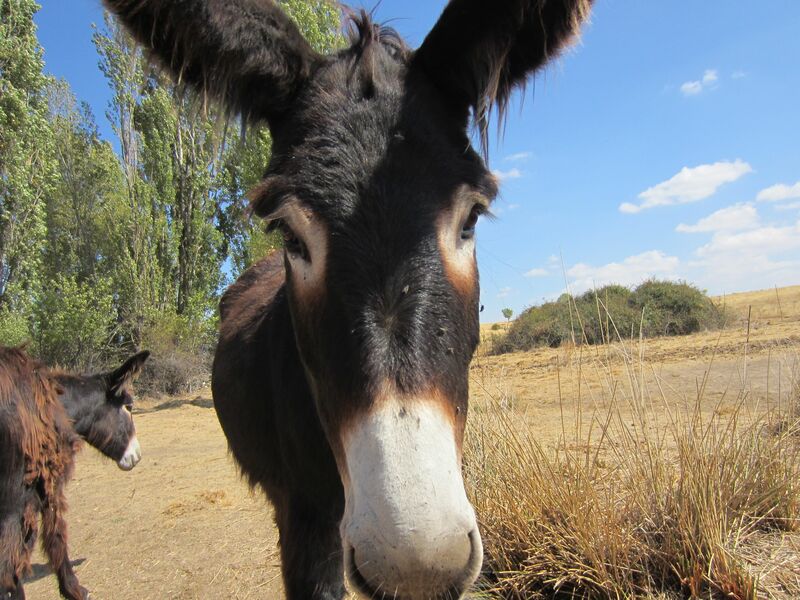 Not to generalize, but all Spanish people get around by donkey. However, I recognize that my opinions here are quite one-sided. I sometimes say unpleasant things about Spanish people, and I should give them some way to respond. So one of my best students has offered, in the interest of bilateral communication between nations, to write a bit about what she thinks of foreign people in Spain. With no further ado, I introduce you to Nuria. I’ve edited a little bit of what she wrote for clarity, but tried to leave some “local flavor” in the writing. Generally, I agree with her. But of course, it is my blog, so I’ve responded to what Nuria says in parenthesis. Anyway, what do the Spanish think about foreign people living in their country? Since I came to Madrid seven years ago, I have met a lot of people from different nationalities. But recently, I’ve had the chance to get to know foreign people better. It’s very gratifying for me because I learn much of other cultures every day. Today, I have to admit that some of them are my friends now. Soon, I discovered their opinions about my country, Spanish people, our culture and our customs. When a foreigner comes to our country, the first thing he discovers is the food. They love the ham, the paella, and the olive oil, of course. Oh! yes. I completely agree with them. We have the best food. But also, they think Spaniards are a little bit unkind. Why? Only because we never say “please.” Is this really important? Some foreign people have been here for a few years, and suddenly they consider themselves experts on Spanish politics. They think they can start speaking about ETA or about the independence of Catalonia… All of Spain’s deepest problems. It’s very insensitive! One argument people have every day is about the Spanish healthcare system. How can anybody speak badly of our health system? Well, maybe they should go back to their countries to have better medical attention. It’s true that over the years our health system has deteriorated, but Spain is now in a huge economic crisis with more than six million unemployed people and the health system costs millions and millions of euros and it’s the biggest sacrifice this country has to make. Parc Güell in Barcelona… fun for non-Spanish people of all sizes! Another kind of foreigner moves to Spain thinking that their life here will be easier than other foreigners because their country is more developed than ours. Americans, for example, think that they are the “kings of the world” and they say things like “How can they do this to me?” or “I am an American citizen!” Perhaps they are, but it’s a very arrogant attitude. My English teacher (That’s me!) publishes in his blog things like “Spanish people dress like a circus in summer!” Someone should tell my English teacher that everybody knows that Americans are the worst-dressed in the world during all the year! Are European girls more liberal? Finally, I guess it’s easier to see the worst of a country than to recognize all the good it has. Being grateful is a virtue. Anyway, I envy foreign people’s love of their respective countries. I love Spain, too, but most Spanish people never say: I love my country. Well, that’s that! One Spaniard’s opinion of foreign people in their country. I guess I should write a few more articles about why Spain is great. Just for some balance. For some things I’ve learned about the USA while living here, check out this article. Or if you really want to have some fun, try Are Europeans more civilized than Americans? Loving Spanishness – in all of its facets and manifestations. P.S. Spaniards, what do you think about foreigners in your country? Leave a message in the comments! P.P.S. I’ve got some more generalizations around here if you want. Check out my instant classic article about dating Spanish girls, for example.